The Quick Release Strap is worn diagonally across the torso from shoulder to hip and is adjustable to fit most photographers. Compatible Devices: all DSLR/SLR cameras with 1/4″ tripod screw, Nikon, Sony, Canon, Olympus, Pentax, Minolta and so on. The unique screw-in plate is made of high quality ABS material with two strap eyelets on both sides for attaching a hand strap and a neck strap. It has a quick accessed secure pocket for storing extra memory cards in their protective cases. Made of superior quality material, durable and elegant. With a buckle for quick adjustments and a screw-in plate for fastening the camera. Designed for reducing pressure when the users carry the large digtal SLR cameras and can make the shoulder comfortable. All DSLR/SLR cameara Nikon,Sony,Canon,Olympus,Pentax,Minolta and so on. Accessory only, the camera is not included! 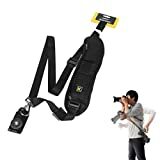 This entry was posted in Discount Photography and tagged Belt, Black, Camera, Canon, Card, DSLR, Neck, Nikon, Pocket, Professional, Quick, Rapid, Shoulder, Sling, Sony, Storage, Strap, Yihya by Ball Photo. Bookmark the permalink.